The writing is on the wall for my daughter and her dummy. I’ve been making a few gentle suggestions that now she’s a big three-year-old, she doesn’t need a dummy. Her look of displeasure is much like that of Marlon the monster up there on the cover of Jill Murphy’s The Last Noo-Noo. My children have all given up their dummies (or num nums as they are known in our house) without much fuss. Around the time of their third birthday they hand over their dummies to a friend with a new or young baby, because “the new baby needs them more”. A friend recently welcomed baby Hamish into the world. Although my daughter doesn’t know it yet, our next visit to see Hamish will also involve a ‘dummy handing over ceremony’. I’ll pave the way with Jill Murphy’s funny story about giving up the dummy, The Last Noo-Noo. 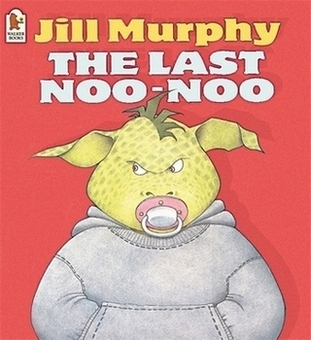 The Last Noo-Noo is available online from The Book Depository for $9.14, with free delivery. Other books about giving away the dummy include No More Dummy for Piggy by Bernette Ford and Little Princess: I Want My Dummy! by Tony Ross. If you have a thumb-sucker as opposed to a dummy sucker, check out our previous post on The Little Bear Who Sucked His Thumb.